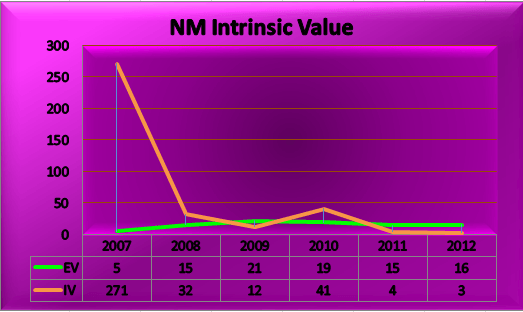 Navios Maritime Holdings Inc (NM) Investment Valuation. The market capitalization of Navios Maritime Holdings Inc was erratic in the movement from 2007 with an average trend of 33 percent. The total debt was 85 percent of the enterprise value, while its cash and cash equivalent were only 11 percent average. The market capitalization was only 26 percent of the enterprise value because of its debt. Let say you are the investor, buying the entire business of Navios Maritime would make you pay for 74 percent of its total debt and 26 percent of equity. The buying price of the entire business of Navios Maritime to date, April 6, 2013, will be $1.7 billion at $15.55 per share. The market price to date was $4.34 per share. Navios Maritime was 74 percent leverage against enterprise value. Net Current Asset Value (NCAV) method is well known in the value investing community. Studies have all shown that NCAV method of selecting stocks has outperformed the market significantly. The concept of this method is to identify stocks trading at a discount to the company’s Net Current Asset Value per Share, specifically two-thirds or 66 percent of net current asset value. The net current asset value approach on Navios Maritime Holdings Inc, tells us that the stock price was trading at an overvalued price from the period 2007 because the 66 percent ratio was only 4 percent of the market price. It shows that the stock price was expensive because the stock traded above the liquidation value of Navios Maritime. By calculating market capitalization over the net current asset value of the company, we can determine whether the stock is trading over or undervalued. The result should be less than 1.2 ratios. The MC/NCAV method shows that the stock was overvalued from the period 2008 to 2012 because the ratio exceeded the 1.2 ratios. The basic meaning of “Margin of Safety” is that investors should only purchase security when it is available at a discount to its underlying intrinsic value or what the business would be worth if it were sold today. The margin of safety was computed as Margin of Safety = Enterprise Value – Intrinsic Value. The margin of safety for Navios Maritime was 34 percent average. There was zero margin of safety for 2009, 2011 and 2012. The margin of safety has not reached the requirement of Benjamin Graham of 40 percent below the intrinsic value; therefore, the stock is not a candidate for buying. Earnings per share and the growth factor the calculation for intrinsic value. The earnings per share were average $1.05, while the annual growth was 34 percent. On the other hand, the average intrinsic value was $60.52. The formula for the earning per share. Sustainable growth rate (SGR) shows how fast a company can grow by using internally generated assets without issuing additional debt or equity. 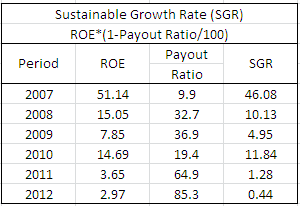 To calculate the sustainable growth rate for a company, you need to know its return on equity (ROE). You also need to know the dividend payout ratio. From there, multiply the company’s ROE by its plow back ratio, which is equal to 1 minus the dividend payout ratio. The result of the calculation for sustainable growth rate shows that the average SGR was 12.45 percent. The return on equity was 16 percent average and the payout ratio was 42 percent average. Return on Equity (ROE) is an indicator of a company’s profitability by measuring how much profit the company generates with the money invested by common stock owners. This shows how many dollars of earnings result from each dollar of equity. Now, there are two ways of computing the sustainable growth rate, the relative approach, and the average approach. I have used the relative approach in the computations above. The average approach produces a higher margin of safety than by using the relative approach. If you observe on the graph above, there are two lines. these two lines are the intrinsic value line which is the true value of the stock and the price. During 2007, the true value of the stock was high above the market price. Then on 2008, the true value dropped down at a rate of 88 percent and going forward, the value remains at a low level. There was zero margin of safety during 2009, 2011 and 2012 because the true value line was below the price line. The margin of safety is the difference between the two lines, in other words, the space in between is the margin of safety. If we calculate the difference, the margin of safety was 34 percent average. This valuation will determine whether the stock is undervalued or overvalued. By multiplying the Price to Earnings (P/E) ratio with Earning per Share (EPS) and then compare it to the enterprise value per share. The P/E*EPS valuation, tells us that the stock price was trading at the overvalued price from 2008 to 2012 because the P/E*EPS ratio was lesser than the enterprise value per share. The ratio represents only 37 percent of the price; therefore, the stock price was expensive. The average approach produces a higher result because it takes into consideration the prior periods performance. The use of this ratio is to separate price and earnings in the enterprise value. By dividing the enterprise value of projected earnings (EPS), the result will then represent the price (P/E) and the difference represent the earnings (EPS). The EV/EPS valuation tells us that the price (P/E) that was separated from the enterprise value was 28 percent average. While the earnings (EPS) was 72 percent average. This indicates that the stock price was undervalued because the price was only one-fourth over to the market price. The EV/EBITDA tells us that it will take 7 years to cover the costs of buying the entire business of Navios Maritime. In other words, it will take 7 times of the cash earnings of the company to cover the cost of buying the entire business. The EBITDA was only 16 percent of the enterprise value. It indicates that the company is not very efficient in generating cash for its daily business operation. The market capitalization was erratic in the movement from 2007 with an average trend of 33 percent. The total debt was 85 percent of the enterprise value, while its cash and cash equivalent were only 11 percent average. The market capitalization was only 26 percent of the enterprise value because of its debt. Buying the entire business an investor would be paying 74 percent of total debt and 26 percent of equity. The buying price of the entire business to date, April 6, 2013, will be $1.7 billion at $15.55 per share. The market price to date was $4.34 per share. NM was 74 percent leverage against enterprise value. The net current asset value approach shows that the stock price was overvalued and was trading above the liquidation value. Therefore it means that it did not pass the stock test. The MC/NCAV approach shows that the ratio exceeded the 1.2 ratios, therefore the price was expensive. In addition, the margin of safety was only 34 percent average; therefore, the stock is not a good candidate for buying. The sustainable growth rate was 12 percent and the annual growth rate was 34 percent. The company’s return on equity was 16 percent and the earning per share was $1.05 average. The P/E*EPS valuation shows that the stock price of Navios Maritime was overvalued. The EV/EPS indicate that the price (P/E) was 175 percent and the earnings per share (EPS) is -75 percent. This might indicate that the stock price was expensive. The EV/EBITDA tells us that it will take 7 years to cover the cost of buying the entire business. Therefore, I recommend a HOLD in the stock of Navios Maritime Holding Inc. Safe Bulkers Inc (SB) is an international provider of marine dry bulk transportation services transporting bulk cargoes like coal, grain, and iron ore globally. Dry Bulk Shipping deliveries continue to increase at the expected pace, a possibility of positive earnings this year is also expected. This Pricing Model was prepared in a very simple and easy way to value a company for business valuation. This model adopted the investment style of Benjamin Graham, the father of Value Investing. In essence, Graham’s Value Investing is to purchase a stock at a discount in which the market price is lower than the intrinsic value. He was looking for companies with a good balance sheet with average debt. In other words, he was looking for undervalued stock. The basis for this valuation is the company’s five years of historical financial records, the balance sheet, income statement, and cash flow statement. I calculated first the enterprise value as our first step in the valuation. I consider this important because this is a great measure of the total value of a firm and is often great starting points for negotiation of a business. The concept of enterprise value is to arrive at a cost to purchase the entire business. In other words, the Enterprise Value (EV) is the present value of the entire company. Market capitalization, on the other hand, is the total value of the company’s equity shares. In essence, EV is the company’s theoretical takeover price, since the buyer would have to buy all of the stock and pay off existing debt and take all any remaining cash. The table below would give us relevant data about SB. The market capitalization continues to drop by 27 and 39 percent from 2010 up to 2012, respectively. Its total debt was 59 percent while its cash and cash equivalent were 8 percent, thus, enterprise value was greater by 51 percent against market capitalization. Buying the entire business of Safe Bulkers Inc., an investor would be paying 51 percent debt and 49 percent equity. In addition, the net cash per share was $2.30 per share. The purchase price of the entire business of SB to date April 10, 2013, would be $894.5 million at $11.93 per share. While the market price to date was $4.99 per share. Benjamin Graham created and tested the net current asset value (NCAV) approach between 1930 and 1932. The average return, over a 30-year period, on diversified portfolios of net current asset stocks was about 20 percent. An outside study also showed that from 1970 to 1983, an investor could have earned an average return of 29.4 percent by purchasing stocks that fulfilled Graham’s requirement and holding them for one year. Benjamin Graham’s Net Current Asset Value (NCAV) method is a well-known value investing community. Studies have all shown that the Net Current Asset Value (NCAV) method of selecting stocks has outperformed the market significantly. The concept of this method is to identify stocks trading at a discount to the company’s Net Current Asset Value per Share, specifically two-thirds or 66 percent of net current asset value. The net current approach of Benjamin Graham tells us that the stock price of Safe Bulkers Inc was overvalued from the period 2008 up to 2012 because the stock is trading above the liquidation value of SB. It shows that the stock of SB did not pass the stock test of Benjamin Graham, therefore the stock was considered expensive. As clearly seen in the table above, the MC/NCAV approach shows that the stock was overvalued from the period 2008 up to the period 2012 because the ratios exceeded the 1.2 ratios. Therefore, the stock of Safe Bulkers Inc did not pass the stock test of Benjamin Graham. The basic meaning of “Margin of Safety” is that investors should purchase security when the market price is lesser than its intrinsic value. The margin of safety is used to identify the difference between company value and price. Value investing is based on the assumption that two values are attached to all companies – the market price and the company’s business value or true value. Graham called it the intrinsic value. The difference between the two values is called the margin of safety. This is the concept taught by Benjamin Graham and still referred to by Warren Buffett. Value investing is buying with a sufficient margin of safety, a minimum of 40 to 50 percent below. In the formula below, the enterprise value was used because it takes into account the balance sheet so it is a much more accurate measure of the company’s true market value than market capitalization. The margin of safety was calculated through the Margin of Safety = Enterprise Value – Intrinsic Value. The average margin of safety for SB’s stock was 67 percent. During 2008, there was zero margins of safety because of the negative sustainable growth rate. However, the following periods from 2009 up to 2012, the margin of safety was impressive. Let me share with you the formula for the intrinsic value. EPS or the company’s last 12-month earnings per share; G as the company’s long-term (five years) sustainable growth estimate, 9 for the constant represents the appropriate P-E ratio for a no-growth company as proposed by Graham (Graham proposed an 8.5, but we changed it to 9); and 2 for the average yield of high-grade corporate bonds. 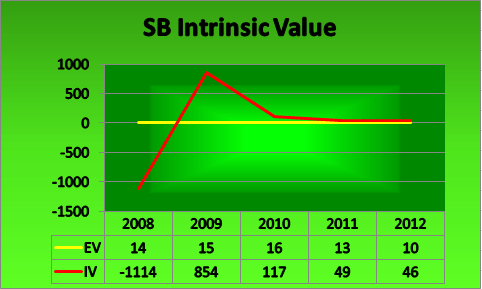 The table above shows that the average intrinsic value was -$9.48 because during the period 2008, the fall of the true value of the stock of SB was great. This is due to the negative stockholder’s equity which produces a negative return on equity. The earnings per share and the growth factor the computation for the intrinsic value. Further, the average earnings per share were $1.90 while the annual growth rate was 16.92 percent average. The table above shows that the average return on equity was -13.15 percent from the period 2008. Return on Equity (ROE), according to the definition, is an indicator of a company’s profitability by measuring how much profit the company generates with the money invested by common stock owners. The Return on Equity shows how many dollars of earnings result from each dollar of equity. As we can see, the enterprise value line which represents the price was stable at $14 average, while the intrinsic value which is the true value of the stock was erratic in movement. The true value of the stock factors the earnings of the company and the growth. From 2008 to 2009, it soared up to 177 percent and then it dropped again to 86 percent the following period. It is safe to buy in 2009 because there is a margin of safety. It almost leveled the following years thereafter. The margin of safety is the space in between these two lines, or in other words, it is the difference between the price and the true value of the stock. Getting the difference would be 67 percent average and this is the margin of safety. This metric is done by multiplying the Price to Earnings (P/E) ratio with the company’s relative Earning per Share (EPS) and comparing it to the enterprise value per share. The stock price was overvalued because the P/E*EPS ratio was lesser than the enterprise value per share. The average P/E*EPS ratio was 49 percent of the price, thus, the stock is expensive. The above table for EV/EPS valuation indicates that the price (P/E) was 57 percent average. Earnings (EPS), on the other hand, was 43 percent average. The result of this valuation is at the discretion of the analyst. The EV/EBITDA valuation tells us that it will take 27 years to cover the cost of buying the entire business of Safe Bulkers Inc. Such a very long period of waiting. In other words, it will take 27 times of the cash earnings of the company to cover the purchase price of the entire business. This valuation also shows the profitability of the company. If you can remember the enterprise value approach, the total debt represents 59 percent of the enterprise value. That was the reason why it will take a long period of waiting to cover the costs. The EBITDA represents only 6 percent of the enterprise value. Further, the stock price was overvalued. because the stock is trading above the liquidation value. Therefore, the stock did not pass the stock test of Benjamin Graham. Furthermore, the MC/NCAV approach shows that the stock price was overvalued because the ratios exceeded the 1.2 ratios. The average margin of safety for SB’s stock was 67 percent and the average intrinsic value was -$9.48. The average earnings per share were $1.90 while the annual growth rate was 16.92 percent average. In addition, the average return on equity was -13.15 percent. Furthermore, the valuation indicates that the stock price was overvalued. The average P/E*EPS ratio was 49 percent of the price. Thus, the stock is expensive. While the EV/EPS valuation indicate that the price (P/E) was 57 percent average. And the earnings (EPS) was 43 percent average. The EV/EBITDA valuation tells us that it will take 27 years to cover the cost of buying. In other words, it will take 27 times the cash earnings of the company to cover the purchase price. If you were able to have a glance with our previous articles, you may get yourselves familiar with Groupon Inc (GRPN). So to refresh our minds, let me spill some beans here. According to our company research, this company is a local e-commerce marketplace that connects merchants to consumers by offering goods and services at a discounted price. Alright, so what would be this report all about? This investment valuation would be more of the market value of the company. What seems to happen with its financial accounting, as investors been longing for financial profit since Groupon’s IPO? Let’s find out. This model is prepared in a very simple and easy way to value a company, it adopts the investment style of the Father of Value Investing Benjamin Graham. The essence is that any investment should be purchased at a discount, meaning the true value should be more than the market value. Graham believed in fundamental analysis and was looking for companies with a sound balance sheet and with little debt. The basis for this valuation is the company’s six years of historical financial records, the balance sheet, income statement, and cash flow statement. Net present value is one way to decide if an investment is worthwhile by looking at the projected cash inflows and outflows. cash inflows, these are the expected cash that the company can generate for the period. Cash outflows, on the other side, are the expenditures to be incurred from generating cash inflows. This model does not predict the future but it uses the historical financial data of the company to project a future financial picture that readers may understand parameters that are not easily understood without using a spreadsheet model. This model will show us how to calculate the value. I will walk you through in every step of the calculation. And before we move over to the table below, let us refer first to the formula shown below. The discounted cash flow spreadsheet above tells us that the calculated present value of the equity was $744 million at $1.14 per share and at a rate of 25.95 percent. In addition, its future value was $1.9 billion at $2.88 per share. The future value of $2.88 is equal to the present value of $1.14 per share. This means, having a choice of taking the amount of $1.14 per share today, you need to wait for the five-time period to have the $2.88 per share. Let say you take the $2.88 today; you will have a chance to reinvest the money at the same rate of 25.95 percent, with the equal time periods and will end up having more than $2.88. Furthermore, the capitalization rate used was 15 percent and the return on investment was 25.95 percent. This was computed based on the trend of ROI in 2011 and 2012 as it is seen that the net earnings of GRPN are increasing. In addition, the 25.95 percent ROI that was used was the projected ratio. Moreover, the calculated present value of Groupon Inc was $4.9 billion at a rate of $7.51 per share. For the 5th year income, it was $486 million $0.75 per share and the present value of the net income was $241 million. The concept of enterprise value is to calculate what it would cost to purchase an entire business. Enterprise Value (EV) is the present value of the entire company. Market capitalization is the total value of the company’s equity shares. In essence, it is a company’s theoretical takeover price, because the buyer would have to buy all of the stock and pay off existing debt while pocketing any remaining cash. This gives the buyer solid grounds for making its offer. The enterprise value approach tells us that the total debt was zero and its average cash and cash equivalent was 28 percent of the enterprise value. The market capitalization of Groupon Inc. had decreased by 57 percent from 2011 so as to its market price. Buying the entire business of Groupon Inc, an investor will be paying 100 percent of its equity. The buying price of the entire business of Groupon Inc to this date, March 28, 2013, will be $1.8 billion at $2.73 per share. This is the takeover price of the entire company. While the market price to date was $6.0 per share. Net Current Asset Value (NCAV) method is well known in the value investing community. Studies have all shown that the Net Current Asset Value (NCAV) method of selecting stocks has outperformed the market significantly. The reason for this is when a stock is trading below the Net Current Asset Value Per Share, they are essentially trading below the company’s liquidation value and therefore, the stock was trading at a bargain, and it is worth buying. The net current asset value approach tells us that the stock price was overvalued because the market price was greater than the 66 percent ratio. The ratio represents only 4 percent of the price. The stock price of GRPN indicates that the stock or did not pass the stock test because the stock is trading above the liquidation value of the company, thus, the price was expensive. The MC/NCAV approach shows that the stock price was overvalued because the ratio exceeded the 1.2 ratios. EPS is the company’s last 12-month earnings per share; G as the company’s long-term (five years) sustainable growth estimate; 9 is for the constant that represents the appropriate P-E ratio for a no-growth company, and 2 is the average yield of high-grade corporate bonds. The result of the calculation shows that the average intrinsic value was -$5.94. The result was negative because the earnings per share were negative due to negative net earnings. Earnings per share were -$0.57 average, in addition, the annual growth rate was 18.25 percent average. Since we mentioned earnings per share already, why don’t we have some additional information so we can get to know more of those terminologies mentioned above? Let’s start with the formula for EPS. The term earnings per share (EPS) represents the portion of a company’s earnings, allocated to each share of common stock. The figure can be calculated simply by dividing net income earned in a given reporting period by the total number of shares outstanding during the same term. Because the number of shares outstanding can fluctuate, a weighted average is typically used. Walking further, I will lead you to the way through our understanding of GRPN sustainable growth rate. The sustainable growth rate (SGR) shows how fast a company can grow by using internally generated assets without issuing additional debt or equity. To calculate the sustainable growth rate for a company, you need to know the return on equity (ROE). You also need to know the dividend payout ratio. From there, multiply the company’s ROE by its plow back ratio, which is equal to 1 minus the dividend payout ratio. 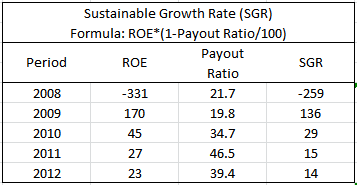 The calculation of the sustainable growth rate indicates that the average return on equity was 4.6 percent, so as with the return on equity because there were zero payout ratios. The company is not distributing dividends to its shareholders. Now, let us work a little more and see what the graph would reveal us. The graph below would make us fully understand the relationship of a price to the true value of GRPN’s stock. The result would be the margin of safety that Benjamin Graham taught us. Above graph shows the enterprise value line which represents the price was far above the intrinsic value line or the true value of the stock. As we noticed, it was below the zero lines, meaning, there was zero value for the stock of Groupon Inc. The space between these two lines is the margin of safety, or in other words, the difference between the true value and market value is the margin of safety. Since the true value was below zero, it means that there was no margin of safety. Therefore buying the stock of GRPN gives us no safety. What does it mean? It means that it will be risky to buy the stock at this period. The purpose of relative valuation methods for valuing a stock is to compare market values of the stock with the fundamentals (earnings, book value, growth multiples, cash flow, and other metrics) of the stock. The P/E*EPS valuation tells us that the stock was trading at an undervalued price because the enterprise value was lesser than the P/E*EPS ratios. The price represents only 81 percent average of the ratio, therefore the stock price is cheap. The EV/EPS valuation indicates that the price (P/E) that was -231 percent, while the earnings (EPS) were 331 percent, thus making it 100 percent. The result for P/E was negative because EPS was negative. The EV/EBITDA tells us that it will take -8 years to cover the costs of buying the entire business. In other words, it will take -8 times of the cash earnings to cover the purchase price. This means, there is no definite period when to cover the costs of buying. This valuation also shows the profitability of the company. It shows that the management is not efficient in generating sufficient revenue for its daily operations. Its gross margin and net margin were 66 percent and -2.89 percent, respectively. The discounted cash flow spreadsheet above tells us that the present value of the equity was $744 million at $1.14 per share at a rate of 25.95 percent. In addition, its future value was $1.9 billion at $2.88 per share. The future value of $2.88 is equal to the present value of $1.14 per share. Moreover, the calculated present value of Groupon was $4.9 billion at a rate of $7.51 per share. The 5th year income was $486 million $0.75 per share and the present value of the net income was $241 million. The enterprise value approach tells us that the total debt was zero. Further, its average cash and cash equivalent was 28 percent of the enterprise value. The market capitalization has decreased by 57 percent from 2011 so as its market price. Buying the entire business of GRPN, an investor will be paying 100 percent of its equity. The buying price of the business to this date, March 28, 2013, will be $1.8 billion at $2.73 per share. This is the takeover price of the entire company. Its market price to date was $6.0 per share. The net current asset value valuation tells us that the stock price did not pass the stock test. Because the stock is trading above the liquidation value, thus the price was expensive. In addition, the MC/NCAV approach tells us that the stock was also expensive because the ratio exceeded the 1.2 ratios. 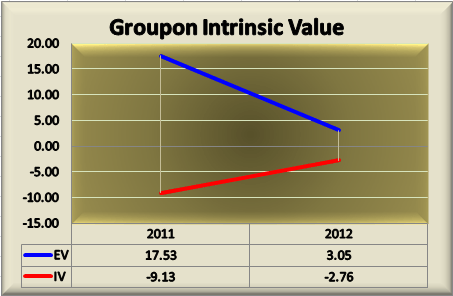 There was zero margin of safety for the stock of Groupon Inc. while the average intrinsic value was -$5.94. The earnings per share were -$0.57 average, in addition, the annual growth rate was 18.25 percent average. The sustainable growth rate indicates that the average return on equity was 4.6 percent. So as with the return on equity because there were zero payout ratios. The P/E*EPS valuation tells us that the stock was trading at the undervalued price. The price represents only 81 percent average of the ratio. Therefore the stock price is cheap. Furthermore, the EV/EPS indicates that the price (P/E) -231 percent. While the earnings (EPS) were 331 percent, thus making it 100 percent. The stock price was overvalued. EV/EBITDA tells us that it will take -8 years to cover the costs of buying the entire business. In other words, it will take -8 times of the cash earnings to cover the purchase price. This means, there is no definite period when to cover the costs of buying. It shows that the stock of GRPN was trading at an overvalued price. And in addition, there was zero margin of safety showing that the company is financially unhealthy or unstable. Therefore, I recommend a SELL in the stock of Groupon Inc (GRPN). To give us a detailed statement, let me give thanks for the Internet because I sought some help on this. To spill the bean, Telecom Argentina S.A. (ADR) is an Argentina-based company primarily engaged in the provision of national fixed-line telecommunication services, international long-distance service, data transmission, and Internet services, as well as mobile telephony. I shared this to you because this report will give us the number side of the company. Knowing what the business is all about is a big help for us. Liquidity is very important since without cold cash business operation cannot run smoothly and effectively. There are several ratios to measure liquidity and they are the current ratio, quick ratio, and working capital ratio. The average current ratio was .76 which clearly indicates that the current asset was only 76 percent against current liabilities. Current asset less inventory over current liabilities or quick ratio was .69 average This clearly means that its monetary asset was 69 percent. And TEO incurred a negative working capital ratio of 35 percent which tells us that that the company’s current liabilities are greater than current assets. As clearly shown in the above table, TEO was not financially healthy in the year 2007 to 2011, however, it was improving year after year. Inventory turnover ratio was 43 times average. This ratio tells how often the company turns its inventory during the course of the year. Because inventories are the least liquid form of asset, a high inventory turnover ratio is generally positive. Receivable turnover ratio was 10 times average which indicates how quickly TEO customers are paying the accounts. The greater the number of times receivables turn over during the year, the shorter the time between sales and cash collection. Payable turnover ratio was 6 times average. This reveals how often payables turn over during the year. A high ratio means there is a relatively short time between the purchase of goods and services and payment for them. A low ratio may be a sign that the company has chronic cash shortages. Asset turnover ratio was 1.1 average. The total asset turnover ratio shows how efficiently total assets generate sales. The higher the total asset turnover ratio, the better and the more efficient asset base is used to generate sales. Calculating the turnover ratios in the number of days equivalent, its inventory was 9 days average, receivable was 35 days and payable was 66 days. It shows an advantage for the company since the funds could be used for short term investment to earn more returns before payables will due for payment. Cash Conversion Cycle measures how fast a company can convert cash on hand into even more cash on hand. So this means, the lower the number, the better for the company. I’m wondering how Rio got the results from the above table so I asked her. To know the cash conversion cycle we need to add the inventory conversion period and receivable conversion period and then subtract the payable conversion period. Using this formula, the CCC resulted in negative 22 for TEO. Leverage is a business term that refers to borrowing. If a business is “leveraged,” it means that the business has borrowed money to finance the purchase of assets, while the other way is through the use of the owner’s funds or equity. Debt ratio average was .54 which tells us that total liabilities was half of its total assets while debt to equity ratio was 1.24 or total debt was 124 percent of owner’s equity. And solvency ratio was 49 percent which means that the company is solvent. The company uses its funds as collateral to make additional borrowing as shown on the debt-equity ratio. In addition, leverage is useful to fund company growth and development through the purchase of assets. But if the company has too much borrowing, it may not be able to pay back all of its debts. For this section, we can determine the company’s investment in fixed assets which could be used in long term periods. Gross PPE investment of TEO average was 23953, its expansion started in 2009 which showed an increase yearly. Accumulated depreciation was 17077 which is equivalent to 71 percent of the gross PPE. And, the net value of property, plant, and equipment was 6876 average or equivalent to 29 percent. By looking at the table, using an estimated life of 5 years, the property had been used up for 3.6 years long and has a remaining service life of 1.4 years more. Revenue was continuously increasing per year, with trailing twelve months of 21219. Its growth rate in 5 years was 17, 15, 20 and 27 percent. Gross profit was 11749. This is the result after deducting the cost of goods sold from the total revenue. The trend is increasing year after year. Operating income was 3803 ttm, this is the result after deducting operating expenses from gross profit. It has a growth rate of 25, 35 14 and 22 percent in five years. Income before tax was 3998 ttm. This is the company’s income before deduction of income tax wherein it was also continuously increasing per year. And income after tax, trailing twelve months was 2534, the bottom line of the business operation, has a yearly growth of 9, 48, 36 and 20 percent. TEO was showing a good trend of income in five years period, with increasing figures yearly, it did not incur a negative amount from 2007 to 2011. The trend of growth was consistent which clearly show that the company is managed well. This refers to the cost of running the business. This includes the direct cost of materials or services, operating and others such as taxes and licenses. The average cost of revenue was 9470 which is equivalent to 51 percent of the total revenue. Operating expense was 7,946 which is 28 percent of the total revenue; another expense ttm was 818 equivalent to 6 percent and total expenses of 8764 trailing twelve months. For us to understand things further, the cost of revenue is the direct cost of the products or services. Operating expenses include sales, administrative and research. Other expense includes interests, taxes, and licenses. Margin refers to the percentage result over total revenue. Gross profit margin measures profitability after considering the cost of goods sold while operating profit margin measures profitability based on earnings before interest and tax expense. Net profit margin is often referred to as the bottom line and takes all expenses into account. Gross margin is the percentage result of gross profit over gross revenue. Trailing twelve months gross margin of TEO was 49 percent of revenue. Operating margin was 20 percent. Pretax margin was 17 percent, this is the income before tax of the company over total revenue and net profit margin was 11 percent, the percentage result of the net income over total revenue. The net profit margin of TEO was not impressive at 11 percent. It is below the standard level of 20 percent. The profitability ratios help users of a company’s financial statements determine the overall effectiveness of management regarding returns generated on sales and investments. Net margin was 11 percent average which is below the standard level of 20 percent. Asset turnover was 1.13. It is a measure of how effective a company converts its assets into sales. Asset turnover ratio tends to be inversely related to the net profit margin, the higher the profit margin the lower the asset turnover and vice versa. Return on asset was 20 percent. It was yearly progressing in five years period. Return on invested capital was 25 percent, with an increasing trend in the last five years which started at 19 percent until 31 percent in 2011. Return on equity using the DuPont model was 28 percent which considers the financial leverage of 2.24. If the company is zero-debt, its ROE was 13 percent. Profitability ratios of the company were not so impressive, net margin was only 11 percent with a return on invested capital of 25 percent. Its return on equity was 28 percent which includes assets which were acquired on credit or loaned. Revenue was yearly improving in five years period, with ttm of 21219. The total expense which includes the cost of sales, operating and other expenses were 18685. After deducting expenses, TEO’s net income was 2534. Total revenue of TEO has a trailing twelve months of 21219, with a total expense of 18685 or equivalent to 88 percent of the total revenue, which resulted to a net income of 2534 or 12 percent of revenue. Okay, here’s the thing about cash flow. Rio said that it is a statement of sources and uses of cash. It provides information about the cash flows associated with the operations and also investing and financing activities during the period. It has 3 categories, namely; operating activities, investing activities and financing activities. This is the key source of a company’s cash generation. In this section of the cash flow statement, net income is adjusted for non-cash charges and the increases and decreases to working capital items. Total cash inflow was 4292. This includes net income, depreciation and amortization, deferred income taxes and other non-cash items. Total outflow was -453 or the changes in accounts receivable, inventory, and other working capital. Net cash provided by operating activities was 4798. It shows that balances are all positive in five years period and are increasing yearly. Operating cash flow of TEO shows sufficient funds left for investing activities which means the company has the capability to acquire additional assets, invest other lines of business and retire debts. For TEO’s transactions from 2007 to 2011, let us see the next table. Total cash inflow was 174 average. Sources of these are PPE reductions, sales/maturities of investments and other investing activities while cash outflows are investments in PPE, net acquisitions, purchases of intangibles and other investing activities, it has an average of -3961. Net cash used for investing activities shows negative balance throughout in five years period because cash outflows are more than its inflows and the company expanded its investments in real properties. The trailing twelve months was -3089. From the name, financing cash flow accounts for external activities such as issuing cash dividends, adding or changing loans or the issuing and selling more stock. Cash inflow was 141 average and derived from debt issued. Cash outflows are debt repayment, dividends paid and other financing activities which have an average of -1664.4. Net cash provided(used for) financing activities from 2007 to 2011 was -1575, -1558, -1686, -1832 and -965 which are all negative balance. This is because its cash outflows exceed cash inflows. Under this category, financing cash flow of TEO incurred negative balance because the bulk of payments are debt repayments, payments of dividends and other financing activities. “Cash inflows are not enough to offset cash outflows,” Rio added. I’ve learned from Rio that positive free cash flows indicate funds available to retire additional debts, increase dividends and invest a new line of business. For negative free cash flow, this indicates the financing is needed to support the operations. So what about for TEO? Is it positive or negative? Rio will give us the answer. Free cash flow of TEO was 1702, 1758, 1797, 1892 and 3217, with trailing twelve months of 2329. These are cash flow balance after deducting capital expenditure from operating cash flow. Commonly used cash flow ratios are cash flow margin, operating cash flow ratio, free cash flow, capital expenditure, and total debt ratio. These are used as indicators of liquidity and to evaluate the risk that may happen in the business. For TEO, cash flow margin was 23 percent which means that the company generates $0.23 of cash for every dollar of sales revenue. Its operating cash flow ratio was 87 percent. it measures the liquidity of the company in the short run since it relates to current debt. While free cash flow was 49 percent which tells us that the company has 49 percent left of cash flow after deducting capital expenditure. Capital expenditure was 2.33 which reflects the efficiency of an entity in employing its operating funds to maintain its assets. Finally, the total debt ratio was 63 percent. This ratio indicates a company’s ability to cover total debt with its yearly cash flow from operations. The higher the percentage ratio, the better the company’s ability to carry its total debt. The above data shows that TEO is efficient enough in handling cash in its business, with a cash flow margin of 23 percent which is greater than the standard of 20 percent and its free cash flow ratio was 49 percent which indicates that it has available funds to retire additional debts, increase dividends and even invent new business. TEO has limited resources to fund its business in the short term period as shown in its liquidity ratios, the debt-equity ratio was 1.24, but improving, since it is yearly decreasing. The company’s revenue was yearly increasing however, its net margin was only 11 percent, while its cash flow margin was 23 percent and free cash flow of 49 percent. Recommended a HOLD until such time net margin reaches the standard level. ZYNGA Inc (ZYGA) Stock Price Fairly Valued? ZYNGA Inc (ZYGA), the star company of this investment valuation report is really popular to me. I can’t let a single day to passed without playing Farmville. I bet you heard that game already. The company is said to be moving away from using Facebook.com as the main way to access its game. ZYNGA INC is new in IPO, its market value had increased by 44 percent from 2012 to the trailing twelve months 2013. The above-discounted cash flow spreadsheet was based on a ten-year historical data for revenue, expense, and equity plus the dividend data together with its ratios. The capitalization rate used was 15 percent and the return on investment was 7 percent, which is the average ROI from the period 2007. The price that was used was the average of 2007 to 2012, which is $5.89. The calculated present value of ZNGA’s equity was $2.58 per share at a rate of 7.06 percent, with a total amount of $1.6 billion. The future value was $3.39 per share for a total amount of $2.2 billion. This future value of $3.39 is equal to the present value of $2.58 per share. This means, having a choice of taking the amount of $3.39 today, you need to wait for the 6 time periods to have the $3.39 per share. If you take the $3.39 today, you will have a chance to reinvest the money with the same rate of 7.06 percent, with the equal time periods and will end up having more than $3.39. On the other hand, the future price of its equity was $1.66 per share for a total amount of $2.2 billion. Furthermore, the calculated 5th-year income was $29.10 per share. ZYNGA INC was new in IPO and was operating its business since the second quarter of 2007. The market capitalization of the company had increased by 44 percent from 2012 up to the trailing twelve months. The total debt was $100 million equivalent to 10 percent of the enterprise value, while cash and cash equivalent were 349 percent of the enterprise value. Because the cash was greater than the market value during 2012, thus, this makes enterprise value negative. The market capitalization of ZNGA had increased by 44 percent from 2012 up to the trailing twelve months. The purchase price for the entire business of ZYNGA INC to date, March 25, 2013, was $1.1 billion at $1.55 per share. This is the takeover price for ZNGA. Market price to date, on the other hand, was $3.42 per share. Studies have all shown that the net current asset value (NCAV) method of selecting stocks has outperformed the market significantly. According to Graham when a stock is trading below the net current asset value per share, they are essentially trading below the company’s liquidation value and therefore, the stocks are trading in a bargain, and it is worth buying. The concept of this method is to identify stocks trading at a discount to the company’s net current asset value per share, specifically two-thirds or 66 percent of net current asset value. In 2011, the stock price of the ZYGA was undervalued because the enterprise value was negative. This means that the 66 percent ratio was greater than the price. Moreover, during 2012, the stock price was overvalued because the price was greater than the 66 percent ratio. Furthermore, if we take the average ratio, the enterprise value which represents the price was $0.61, while the average 66 percent ratio was $2.16. So, overall the stock price was undervalued because the price was lesser than the 66 percent ratio. Thus, indicating that the stock price has passed the stock test of Benjamin Graham. The MC/NCAV approach of Benjamin Graham is another way of testing the stock; whether it was under or overvalued. The result should be less than 1.2 ratios. Graham will only buy if the ratio does not exceed 1.2 ratios. The above table shows us that the stock price was fair valued in 2011. For the reason, the ratio was 1.2 and did not exceed the 1.2 ratios and it was not lesser. On the other hand, in 2012, the stock price was overvalued because the ratio was greater by 126 percent. Therefore, the stock did not pass the stock test of Benjamin Graham. 2 for the average yield of high-grade corporate bonds. The earnings per share and the growth factor the calculation for the intrinsic value. The average intrinsic value was -$11, while the growth was an average of 21 percent. In addition, the average earnings per share were $0.84. The figure can be calculated simply by dividing net income earned in a given reporting period by the total number of shares outstanding during the same term. Sustainable growth rate (SGR) shows how fast a company can grow using internally generated assets without issuing additional debt or equity. To calculate the sustainable growth rate for a company, you need to know the return on equity (ROE). You also need to know the dividend payout ratio. From there, multiply the company’s ROE by its plow back ratio, which is equal to 1 minus the dividend payout ratio. The sustainable growth rate was 5.92 percent average. There was a zero payout ratio because ZYGA was not paying dividends to its stockholders. While the return on equity was averaging 5.92 percent as well, the same as the sustainable growth rate because there was no payout ratio. 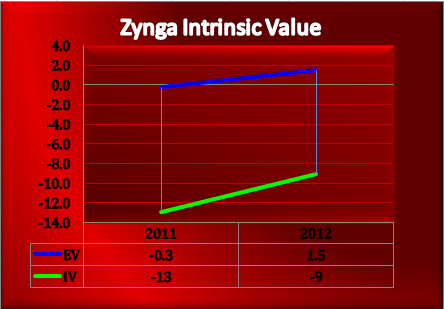 Below is the graph of the intrinsic value of ZYGA. As what we can see, the intrinsic value line which represents the true value of the stock of ZNGA was under the zero line. This means that the true value of the stock was negative. On the other hand, the enterprise value which represents the price was higher than the true value, meaning there was no margin of safety in the stock of ZNGA. As a result of that, the stock of ZYGA did not pass the requirement of Benjamin Graham of at least 40 percent below the true value of the stock. This valuation will help us determine whether the stock is undervalued or overvalued by multiplying the Price to Earnings (P/E) ratio with the company’s relative Earning per Share (EPS). And then we will compare it to the enterprise value per share. The PE*EPS valuation tells us that the stock was trading at an undervalued price because the price was lesser than the PE*EPS ratio. The enterprise value was only 8 percent of the PE*EPS ratio, thus the stock was trading cheaply. The EV/EPS valuation tells us that the price (P/E) was -421 percent, while the earnings (EPS) was 521 percent. This metric is used in estimating business valuation. It compares the value of the company inclusive of debt and other liabilities to the actual cash earnings exclusive of non-cash expenses. This metric is useful for analyzing and comparing profitability between companies and industries. It gives us an idea of how long it would take the earnings of the company to pay off the price of buying the entire business, including debt. Let’s find out. The EV/EBITDA valuation tells us that it will take 2 years to cover the purchase price of buying. In other words, it will take two times the cash earnings of the company to cover the cost of buying. This valuation also shows whether the company is profitable or not. The average gross margin of 2009 was 68 percent. And the net margin for the trailing twelve months was 16.35 percent. The present value was $2.58 per share at a rate of 7.06 percent, with a total amount of $1.6 billion. While the future value was $3.39 per share, a total amount of $2.2 billion. Moreover, the future price of its equity was $1.66 per share, a total amount of $2.2 billion. Further, the calculated 5th-year income was $29.10 per share. The enterprise value approach tells us that the market capitalization had increased by 44 percent from 2012. The total debt was $100 million, equivalent to 10 percent of the enterprise value. While cash and cash equivalent were 349 percent. Thus, this makes the enterprise value negative during 2012 because cash was greater than the market value. Moreover, the market capitalization of ZNGA had increased by 44 percent from 2012 up to the trailing twelve months. The purchase price for the entire business of to date, March 25, 2013, was $1.1 billion at $1.55 per share. This is the takeover price for ZNGA. While the market price to date was $3.42 per share. The 66 percent ratio was greater than the price. Moreover, the stock price was overvalued because the price was greater than the 66 percent ratio. This implies that the stock price did not pass the stock test of Benjamin Graham. Moreover, the margin of safety was a zero because the intrinsic value was negative. The average intrinsic value was -$11, while the growth was an average of 21 percent. In addition, the average earnings per share were $0.84. Furthermore, the sustainable growth rate was 5.92 percent average. The payout ratio was zero because ZYGA was not paying dividends to its stockholders. While the return on equity was averaging 5.92 percent the same with the sustainable growth rate. The relative valuation tells us that in the PE*EPS valuation tells us that stocks were trading at an undervalued price. Because the price was lesser than the PE*EPS ratio. The enterprise value was only 8 percent of the PE*EPS ratio, thus the stock was trading undervalued. Moreover, the EV/EPS valuation tells us that the price (P/E) -421 percent, while the earnings (EPS) was 521 percent. This valuation approach depends upon the discretion of the analyst whether the ratio was appropriate or not. The EV/EBITDA valuation tells us that it will take 2 years to cover the purchase price of buying the business. In other words, it will take two times the cash earnings of the company to cover the cost of buying. The stock price of ZYGAwas fairly valued, and there was zero margin of safety in buying the stock. Therefore, I recommend a HOLD on the stock of Zynga Inc.